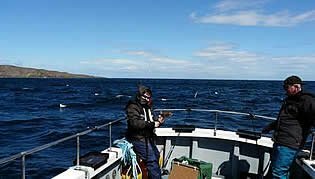 Boat Charter and Sea Angling, Eyemouth, Berwickshire Coast. The weather was not with us with winds to gale force 10 west south west. The only chance was to tuck in close to the cliff if the guys wanted to fish and even then this was not going to be comfy. They decided to give it a go so off we set bless them. Well suffice to say it was testing for the boat and all on board. 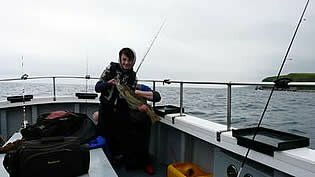 Anyway, after surviving the journey there, we set the drift and the guys got to work and despite the weather the fish started to come onboard - codling and a good size. After 4 hours of a roller coaster ride and a good catch we were all ready to head home at about 6 knots due to very heavy sea state. Very well done guys. It can only get better. Great to see Dad, Pete and son Max back on board. 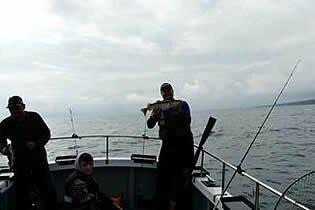 The weather was great and the fishing just gets better as we go into the season. So I'm going to let the photos do the talking. Well done to all the anglers and a special well done to young Max. I had the pleasure this past weekend of a group of anglers, including the star of the day young Ben, accompanied by Dad Tony, his Dad Duncan and Ben's Granddad, Sean. It was such a pleasure to see a family group of guys enjoying each others' company as well as a great day's angling. The way that they helped each other was a treat to behold. Young Ben could not have been in better company. It's wonderful to see the effect of having a junior angler on board. All you anglers out there show your best side and always help. All I can say is what a pleasure having guys like you on my boat. You make my job the best job in the world. And to finish, very well done Ben, you showed the old timers how to do it. A note from the skipper. Firstly I would like to thank all of my guests for their support, past and future. 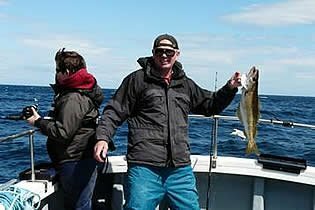 Know that the sun is blessing us with its company on the odd occasion, and along with the weather the fishing has stepped up in leaps. Up to now the numbers are well up on this time last year and the variety of species is as good as it gets. 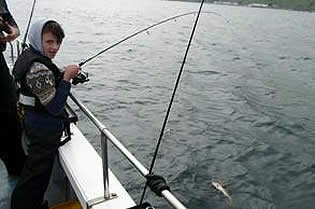 All in all it's set to be a bumper year for rod angling. GREAT! 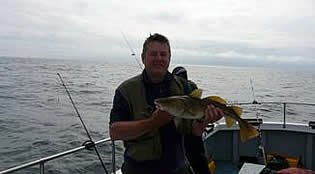 May I take this opportunity to apologise to the anglers that don't get a mention on the site. I'm getting on in years and can't remember all my guests, but if any angler would like to be mentioned, please ask. Many thanks until the next time.